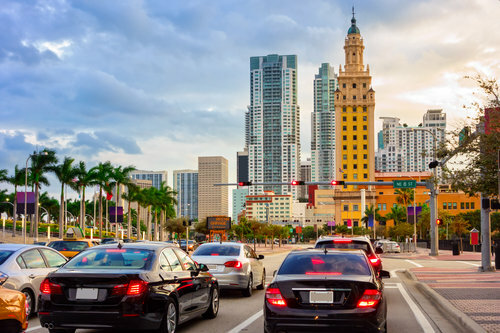 If it seems to you like more and more people are moving to Florida, you would be correct — the state saw the second-biggest increase in population in the country last year, according to the U.S. Census Bureau’s national and state population estimates. Between July 2016 and July 2017, the U.S. population increased by 2.3 million, or 0.72 percent, bringing the nation’s total population to 325.7 million. In this 12-month span, Florida gained 327,811 residents, second only to Texas, which saw a growth of 399,734. The national population grew 0.72 percent overall in 2017. 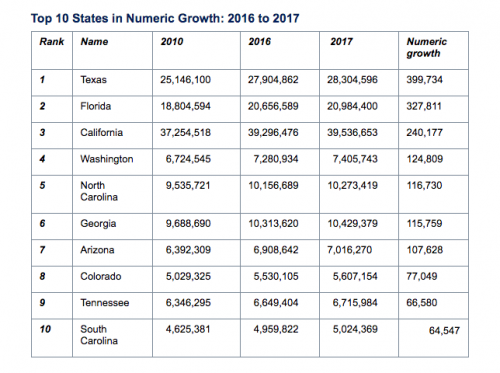 Florida saw a 1.6 percent growth and remains the third-most populous state with a population of 20,984,400.
International migration remains a critical factor in U.S. population growth, despite the first drop since 2012-13. Between 2016 and 2017, net international migration fell 1.8 percent. Still, in the last year, over 1.1 million people migrated to the United States. The population of voting-age residents 18 and older increased from 2016’s 249.5 million people to 252.1 million in 2017. This 0.93 percent boost makes 77.4 percent of 2017’s total population residents of voting age.